Want to know more? See my first post or this fun little questionnaire. Katie, you are a terrific writer! I love your expression and wit. You have a least begun something I’ve always dreamed/hoped/promised I would do…WRITE! Great blog, ladies, and God bless your men! I totally enjoyed the read and the dogs are simply great! May every good and perfect gift be yours today! Thank you for the kind words and for stopping by, Jeremiah! I loved reading about some of your amazing adventures….! What an enjoyable and exciting life!!! Keep up the writing and the traveling… Who knows where it will lead you???!!! Thank you, Jacque! I had no idea you read this. :) Rest assured that if I can feasibly (aka. financially) find a way to keep up the travel AND the writing, I most definitely will. Thanks for your support! Hi Katie & Erin its Eugene sorry been away for awhile but I am back (new account) hope you have both been doing well :) I have some catching up reading to do! I started my blog again its on a new social networking site that just launched on the o1 27 11. The system there it actually looks like your reading an actual piece of paper. As an English major and a language lover I have to say that “domestiphobia” is probably my new favorite word. Thank you so much for this. This comment just completely made my day. Thank you! Lol! If I were a lesbian, I doubt I’d be lucky enough to be with someone as hot as Erin. ;) And it’s too bad we’re not, because then at least we’d have found our more “unique” niche in the blogging world! okay 1. um, marry me? crap, you already did that. we are the same person. and i think with our phobias combined, and our love for photography and writing and travel and restlessness… we could be on to something brilliant. i dont know what. but i think we should figure it out. When you come up with our million dollar idea, let me know. At first I thought it was strange your blog had both house related and travel articles….and this about section really cleared things up. This is a really original idea!!! You’re writing is also very clever and witty. Keep it up. Your post, Chasin’ Waterfalls, will be featured on my blog, http://lesleycarter.wordpress.com/, tomorrow. It will be live at 1:30 Pacific Time. If you have any questions or would like anything changed, please let me know at lesleycater@live.com or by commenting below the post. Also, if there are very specific questions directed toward you, I’d love if you could take a few minutes to answer them. Hey! I really love your blog. You’re awesome at sharing your unique life story. BTW, I’ve tagged you in my latest post! Hey nice to meet kindred spirits like you! I’m celebrating my 10th year after quitting my banking job to travel and I can tell you that I am now living the life I’ve always wanted to live and that would have never happened if I hadn’t taken that risk. How did I manage to never read your about page before? This is great! I love your attitude. You’re a great writer! You think so much like me that it is mildly startling. I’m a bit of a domestiphobe, myself. It seems that each week, two more friends or couples I know are rushing into engagement, and I’m all like, “I’m moving to Israel, and then interning in DC, then doing grad school… and my boyfriend’s cool with it.” I wish I understood the rush, but I know my life will be more fulfilling in ways that others won’t have the opportunity to experience because I’m NOT rushing. It’s great to see there are other girls out there who think independently and rationally. I’m glad I’m not the only one who values my own life that my parents gave me over the idea of bringing another into the world. Cheers! You’re fantastic! Thanks Stephanie for stopping by and I hope you stick around! I am so glad that I have found your blog. 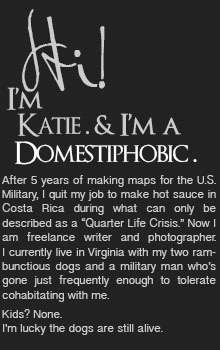 As a writer myself, a once military wife (still married just no longer in the Marines) and a wondering soul, I completely, 100 percent relate to you and your words. In another strange coincidence, we are child free by choice (with two dogs) as well. I love your writing and hope to see more. I’d visited your site before, but this is the first time I really took the time for it and I just wanted to say you rock. LOVE “Dwell” posts and the way you write! Aww, thank you Sofie!! That really means a lot — especially coming from a “colleague.” :) I hope you’ll stick around! I haven’t read any of your posts except the one where you introduced yourself and said you’re a domestiphobic. I have everything too. A house, theee grown kids, (two still live with me). They prolong my life. My youngest son says it’s not fair when I say that coz it puts a guilt trip on him when he decides to leave the nest. I’ve been divorced twice. First one was physically abusive and the second one (Brian), two of my three kids’ dad whom I was married to for 8 years had a gf that I didn’t know about. Twenty one years ago, he decided to call it quits. My youngest was 5, daughter 7, and my eldest from the first marriage was 11. I was, in every bone of my body, very domesticated and subservient with both ex husbands. Now I have a bf who loves me in his own demented way. The type: his way or no way. I dated Dan a few times before I met my 2nd husband. He went to Chicago for a radio station job and I haven’t heard from him but when he came back to The Bay Area after two years in Chicago, it was too late coz I was dating Brian already. When Brian decided to call it quits, Dan came in the picture again. To make the story short, I can’t bring myself to be domesticated anymore! Every time Dan is at my house, he expects me to cook. I don’t mind cooking a simple meal for my youngest son (26). My son usually says no thank you anyway. I guess maybe coz there’s no pressure there but with Dan it’s a different story. He’d want certain kinds of food. If I cooked steak without veggies, he’d make a comment, etc. Dan is a provider and I know he’s always got my back. My youngest son, who’s always the voice of reason, told me one time in one of my depressive state, that preparing Dan’s meals shouldn’t be that bad since Dan has done so much for us. And I agree! But why do I feel suffocated?! I looked up phobias and came across domestiphobia. I can’t diagnose myself but I have all the symptoms. At this point, I’m just so depressed. Before I left my house today, I told Dan let’s go out for a nice big breakfast, my treat! He said, “Just leave me alone!” Our fight started last week coz I wouldn’t prepare his hot meals. I’m in my car writing this long drawn out story, crying, and just feeling so depressed. I’ve thought about cutting myself when the domestiphobia followed by depression got really bad.